Tiny and cute, yet adding a surprising amount of vibrant color to table and counter spaces at home or the office, these mini artificial succulents provide a subtle yet uplifting accent that fits anywhere. The realistic looking faux plants are contrasted with their bright white ceramic planters, which provide versatility for a variety of decors. Useful for brightening desks, reception areas, or restaurant tables, these diminutive desert plants add a bit of charm wherever they're placed. SPECS: 2.75 - 3.75 H x 2.25 W x 2.25 D (in inches). 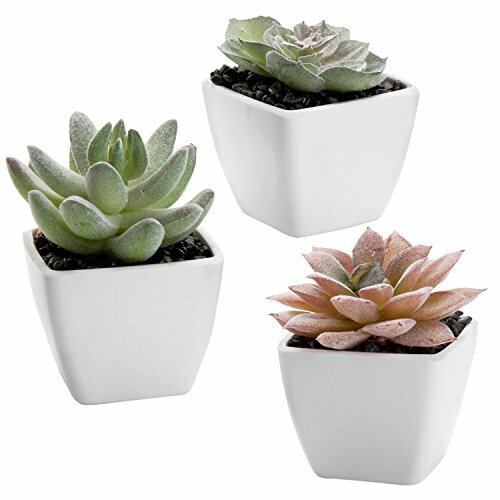 MINI SUCCULENT SET: A variety of 3 small faux desert plants in white square planters. SMALL SPACE DECOR: 3-inch size allows discreet decorative placement on desks, counters, restaurant or cafe tables, and shelves. VERSATILE ACCENT: White planters provide contrast to vibrant plant color, and complement a variety of decors. LOW-MAINTENANCE: Artificial plants require no watering to maintain a vibrant look.